260 holiday apartments located nest to a sandy beach. Facilities include, restaurant, bars, beach club, indoor and outdoor swimming pools, Kids Club, tennis, mini-golf, badminton, games room, Fitness Centre, etc. Discount rates online. The Monica Isabel Beach Club offers 3-Star holiday Apartments with 260 units composed of Family Rooms, Studios, One and Two bedrooms. 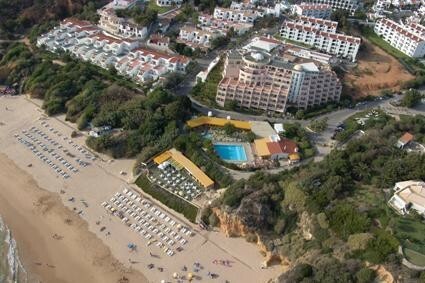 Located in Albufeira at Forte São João Beach which is still within walking distance of the of the old centre of the town. All the apartments are fully furnished and equipped with all the necessary units for an enjoyable stay. An ideal location for the all the family with many activites and facilites to enjoy. It has direct access to the beach on which there is their own Beach Club. There is an indoor and outdoor pools, a restaurant and three bars, snack-bar and a mini-market. Sports facilities at the complex include volleyball, snooker, tennis and badminton, while younger guests will also be kept occupied with their own playground and mini golf. There is a Fitness Centre, sauna, Jacuzzi, and a solarium. The Monica Isabel Beach Club boasts a wide variety of entertainment for all ages and provides an ideal getaway for a fun filled family holiday.